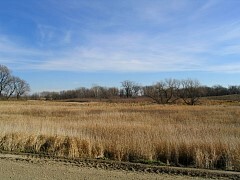 It's a warm sunny fall day in south-central Minnesota. The roads are dusty and the sky is a glorious blue. 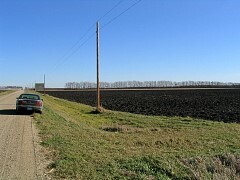 Right off the bat I spotted a rooster loafing along the edge of this field. I got out to try and flush him, but he ran like hell one way or the other. I guessed he ran toward the tree lot in the background, so I walked down there. No sign of him. 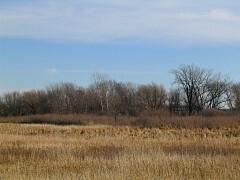 When I drove by this scene, two roosters flew from the left-center picked corn and landed by the white popular trees. 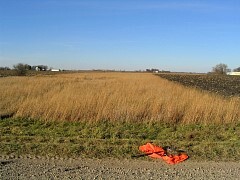 The picture at the right is a close up of the area they landed in. I walked out to the right, then cut in by the trees, but didn't flush anything. The roosters seem easily spooked, which is not a good sign. 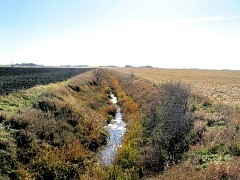 Here is a drainage ditch I chose to walk. It goes way back to the railroad tracks. 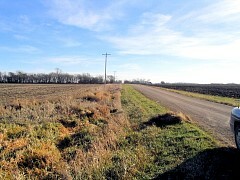 From there I crossed the ditch to the long line of trees and followed it back to the road. Just a very long walk with only myself for company. Let's discuss what the pheasants are busy eating these days. 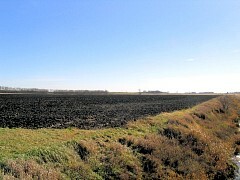 The left-most picture shows a picked and disked corn field. 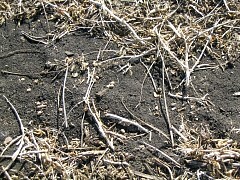 Waste grains of corn are lying about. 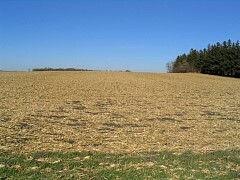 Pheasants roam the picked fields eating these kernels of corn. They try and do it as close to cover as they can, because hawks like nothing better than to swoop down and grab a pheasant. 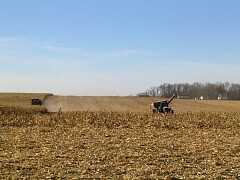 Almost every pheasant I shoot has a crop filled to bursting with corn. 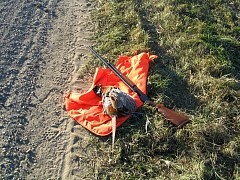 A crop is a sack in the pheasant's throat like a little bag where it can store food. It's hard to imagine someone out here cranking on this thing - some sort of ditch pump? 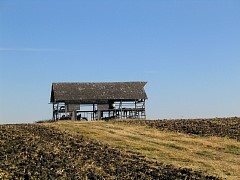 Maybe it's part of a farmstead that is long gone. I have never seen anything like this before. In the south they have open-sided tobacco barns, but I don't think they grow the big leaf around these parts ... even though it's southern Minnesota. 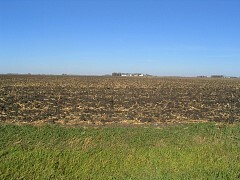 Just a flat harvested cornfield. 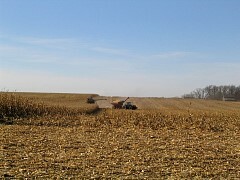 Most of the corn has been harvested, but these fellows are busy gathering in the corn crop. 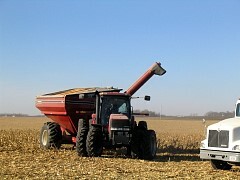 American agriculture at its finest. I bet they don't get many folks coming out to photograph them working. 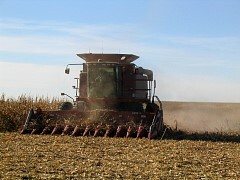 This is a twelve row combine - count for yourself. I encountered this dog on a county highway. It looked like he had somewhere to go. 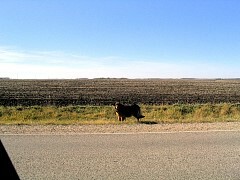 Behind this dog is a picked bean field. 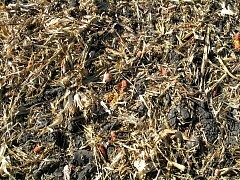 The right-most picture shows waste soy beans lying on the ground. 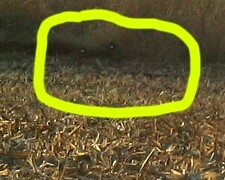 I have never seen beans in a pheasant's crop, only corn. But they say pheasants eat scattered soy beans too. I hadn't seen any pheasants for a while. About 4 o'clock I walked this little patch of weeds. I went down the left side, made a u-turn, and walked back up the right side. 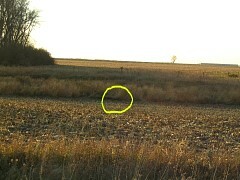 Within 20 yards of the road this rooster jumped up and, startled, I shot him. U must have driven him to the right side of this weed patch when I started, and he held until I got back. It's all about pinching them into corners. This is my grandfather's other Winchester model 12 12-guage that my brother has lent me. It doesn't have a solid rib like the other one I usually hunt with. This rooster has a very sharp spur, meaning that he is a two year old rooster. I have not seen a rooster other than a yearling for a few years now. It's nearing sundown, and these two roosters flew and landed to the right of me. I took these pictures to try and show them. 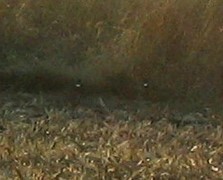 Look for the white ring around their necks. Same two roosters, slightly different setup. 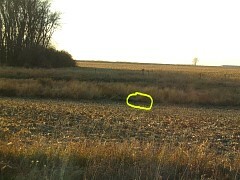 These are too far away to shoot, plus there was a farmhouse close by. It's been an enjoyable day.